I don't think she should be that pretty. 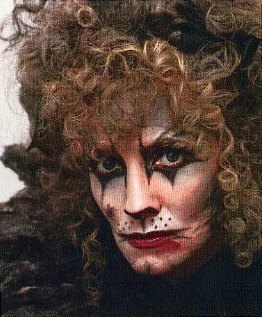 I've always felt that Grizabella was a former glamour cat. She used to be very beautiful. I thought that was kind of the point but I guess that concept has been abandoned. I'm more infuriated that they cut Growltiger. If they were worried about offending modern audiences they could have kept the song and just removed the lyrics about the Siamese and changed the attacking horde to a rival pirate gang instead. Or if they just had to cut it they could have made a more clean cut like the DVD version and left Pekes in the first act where it belongs. Moving Pekes and equating that reenactment with the kind of proper theatre mentioned in Gus the Theatre Cat is absurd. The cast of CATS will be performing this Thurs, Aug. 4th on Good Morning America. More TV news as I get it. Not a fan of the slower tempos. I'm not sure how to describe it but the choreography seems to lack fluidity. Like they're moving from one pose to another with nothing in between. It looks like the original choreography but it's missing something. I'm starting to understand what fans of A Chorus Line were talking about when they described the revival choreography as missing the hand of the master. I'm just not a fan and I'm still disappointed about the removal of Growltiger. I know it wouldn't have been possible to replicate what was done in the Winter Garden but some of the changes here seem like change just for the sake of change. Just to be able to say it's new. For me it wasn't broke and didn't need tweaking. Edit: They're clearly talented dancers, but I agree that the new choreography seems a bit pedestrian compared to the original. I'm going to NYC in January, so I'll reserve my judgment until then. Today's Good Morning America CATS segments. Last edited by VTWC on Thu Aug 04, 2016 2:40 pm, edited 1 time in total. I agree about the slow tempos too. Will be there this weekend and will give a full update when I get home on Monday with my thoughts and musings about all the new changes. I also thought that the dancing was "pedestrian" too. Like it did lack something. I could see most of the old moves through the new stuff, but since the Jellicle Songs segment was so short, only a few verses, I don't have much to go on. Have to see how it all looks in person. Also, Leona gave a good delivery I thought. She had a slight "Mariah Carrey" warble to her notes though, that pop star crap thrown in which I'm not a fan of. Also, on a side note, taking away Growltiger was horrible for me. I have always loved that section of the show of Gus' "memory." Having it cut since it is now considered "racist" is upsetting to me. They could have changed the actors to singing in a normal voice, instead of the sing-song chanting. The Siamese are the good guys! It's such a funny number with the hammy Opretta by Growl and Griddle too. Throwing in Pekes in Act 2 is a shame, plus it shortens the show quite a bit. Great article with nice slideshow of Georgina! Loved this!